Authenticity, vitality and dynamism are the chief characteristics of the new Avenue line by Wenger. This green silicone strap men's watch is the perfect combination of durability and simple style, ideal for the modern, 21st century man. Its white dial, with discreet date window, compliments the green silicone strap effortlessly. 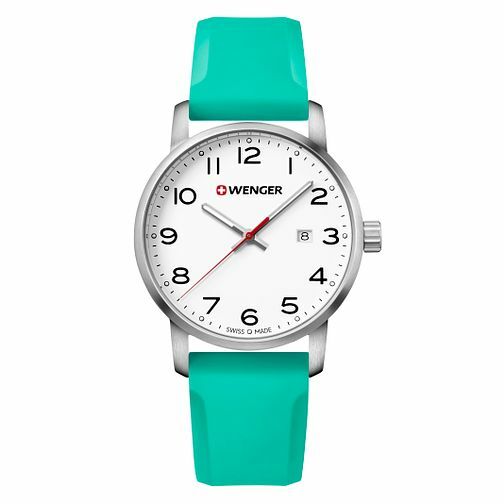 Wenger Avenue Men's Green Silicone Strap Watch is rated 4.0 out of 5 by 1. Rated 4 out of 5 by Anonymous from Beautifully designed and manufactured swiss quartz for either men or women. The dial is clean and clear. The size is versatile - not too big or too small, but slim and light for anyone and suitable formal/informal wear. The styling and colouring is neutral so can be worn with a wide range of clothes or straps. The green strap is extremely comfortable and very nicely made, with a textured underneath to stop slipping and a buckle with the Wenger logo. The lugs have double pin holes so thick leather straps (eg nato straps for that extra military look) can also be used with ease on the outer holes. With a water resistance of 100m, this watch is suitable for just about every occasion, as well as being stylish and reliable.